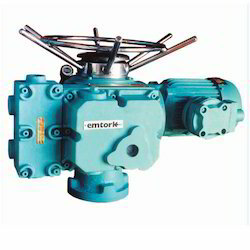 Offering you a complete choice of products which include flameproof explosion proof three phase electrical actuator. Owing to our proficiency in this domain, we are providing our clients an optimum range of Flame Proof Actuator that is ideal for valve control, as well as many other applications in hazardous environments. The provided actuator is precisely manufactured using high class material and latest technology in synchronization with set industry standards. Before being delivered, the offered actuator is inspected on different quality measures to ensure its durability. Modulating/ Regulating M500, M600, Also with supplementary spur gear boxes.